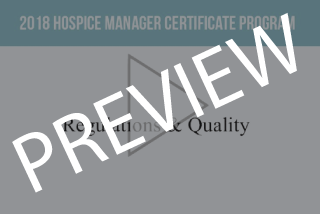 The Hospice Manager Certificate Program (HMCP®) is an interactive and intensive educational program, providing leading edge management concepts and skills that are critical for all levels of hospice managers to know and understand. This program is designed to improve skills in the critical areas of: leadership, marketing, budgeting, finance, compliance, regulatory and human resources. In addition to these important skills, this program will cover the new hospice conditions of participation and federal laws impacting hospice agencies. The Hospice Manager Certificate Program (HMCP®) was designed for front-line supervisors, new or established business owners, administrators or assistant administrators, directors or assistant directors, CEOs, COOs, operations managers, human resource managers, finance and marketing managers, case managers, clinical nurse supervisors, DPCS, DON, hospice managers, office managers, emerging or middle managers, or any middle management personnel of a Medicare-certified hospice agency. 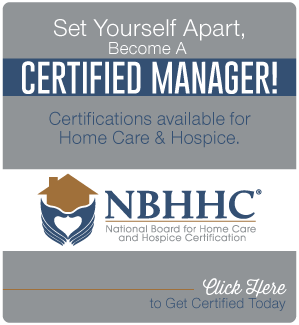 More experienced managers will gain insights and a refreshed understanding of hospice. Ms. Lee has over 20 years of experience in home health and hospice arena. Most recently she has provided education at the Regional Home Health and Hospice Intermediary (RHHI) level and for OASIS Answers. She is an expert in, and speaks nationally on, Medicare regulatory requirements and documentation. Annette has a wide array of experience that makes her accessible and a valuable resource to providers. An RN since 1990, she continued her education to obtain her Master's in Health Care Administration. Her career has had an emphasis in community health care, with positions ranging from a community case manager to the Provider Outreach and Education Coordinator at an RHHI. These experiences have made Annette an expert in both the clinical and quality medical review sides of coverage for home health and hospice, and of governmental forms and requirements such as the OASIS, ABN/HHCCN and the Hospice and Home Health LCDs. As the Education Coordinator, she identified trends and problem areas for the home health and hospice community, as well as with individual providers. She teamed with providers to develop and implement a plan to assist in correcting these issues. She is a sought-after speaker and has presented at regional CMS meetings, NAHC and NHPCO as well as many state association meetings. Ms. Dawson has 20 years of experience in the health care industry. She attended the University of St. Mary in Leavenworth, Kansas, where she received her Bachelor's in Psychology. Ketti then attended the University of Central Missouri and earned a Master's degree in Social Gerontology. Ketti began her career in Tulsa, Oklahoma. She worked in the skilled nursing arena as the Director of Social Services and eventually became a licensed nursing home administrator in Oklahoma. She was the Assistant Administrator for Tulsa Jewish Retirement and Health Care Center. She was very involved in the Tulsa medical community and received the Silver Service award by the Tulsa Area Agency on Aging. When she moved to Kansas she was the Executive Director of a large assisted living in Kansas City, Kansas. This assisted living facility was the first of its kind - working with Medicaid, Housing Authority and used tax credits to provide services to low income residents. Ketti was "recruited" into hospice for the role of Administrator in 2007. She was the Administrator for a large for-profit agency, part of a national company, in the Kansas City, MO area. While she was with this company, she opened an additional hospice site in Leawood, KS. She has been the Administrator for Village Hospice in Lee's Summit, MO since 2012. Village Hospice is under the John Knox Village community health services system. In 2015, Ketti received the "Friend of Music Therapy" award at the American Music Therapy Association national conference. During the last few years, Ketti has enjoyed presenting at the Hospice and Palliative Care Association of Iowa, Missouri Alliance for Home Care and other venues in the Kansas City area. 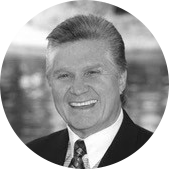 He is the author of Creating Extraordinary Joy, Joy in the Workplace, Catch the Wind with Your Wings, the series of 5 books titled Synergizing Your Business, and his latest book, Synergy Strategic Planning. Recently, along with a team of educational specialists, Chris won the Los Angeles Area Emmy Award for Overall Excellence in Business Education.This was followed by the Aegis Star Award for the Time Warner show “Working Wardrobes for a New Start” and his two PBS TV shows, Creating Extraordinary Joy and Joy in the Workplace. The On-Demand HMCP® comes with a three (3) month subscription to the content. This program is designed to be completed within the designated subscription length. However, we understand that circumstances arise that may prevent timely completion. If additional time is required to complete your program, extensions can be purchased in two week increments for $100 each. Extensions must be requested in writing to the CAHSAH registrar prior to your original subscription expiration date. There cannot be any lapse in enrollment between original subscription and extensions. No exceptions will be made to this policy.